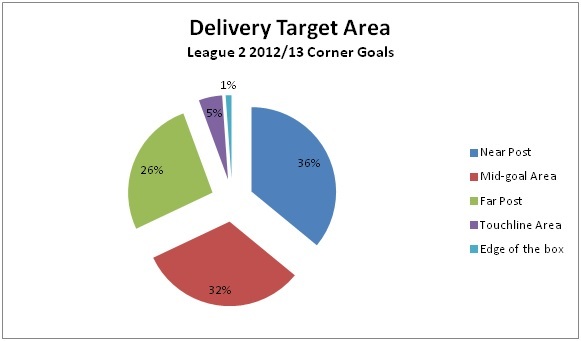 What is the most effective tactic to score corner goal in League 2? By analysing 178 League 2 corner goals, it would be tested whether his argument can be applied to League 2 or not. There is not much difference in terms of the sides of corner. 50.6% of corners were from the left side of the goal. The above chart shows that most of the corner goals were delivered by inswing (61%). 30% of them were outswing and 9% of them were ground pass which included medium or short corner. The finding fits the argument of Hughes that inswing is the best way to score corner goal. In terms of delivery target area, the result is not as dominant as the result of delivery type. Although near post was the most popular delivery target area, it was not dominant with 36%. 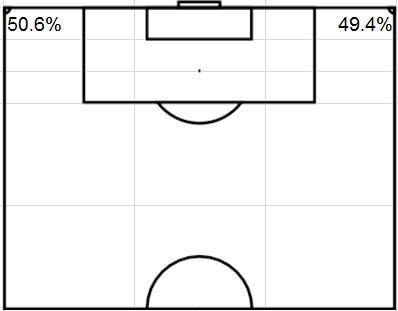 In fact, the percentages of mid-goal area and far post were close with 32% and 26%. 5% of corners were delivered to touchline area which means they were short corners. Only 1% of corners were medium corner which were delivered to the edge of the box for long shots. By looking at this chart, Hughes’s argument about near post delivery is not very strong here because the difference between near post, mid-goal area and far post were within 10%. Near post is still a better choice but it is not a dominating factor as inswing delivery. Then the data would be compared with each other for in-depth analysis. The above chart shows that the preferences of delivery were different depending on which side of the corner it was. If the corner is taken at the left side of the goal, most of them were delivered by inswing. It could be explained by the fact that most of the players were right-footed. It is interesting to see which approach the team would use in the right side corner. 45 right side corner goals were delivered by inswing. That means teams chose a left-footed player to deliver the corner for the purpose of inswing delivery. However, 36 right side corner goals were delivered by outswing. This number is much more than the number of left side outswing corner (17). On the other hand, the numbers of ground pass delivery in both sides were similar. No matter which side we look at, inswing is still the most popular choice of delivery although it is more dominant in left side corner. In the right side corner, teams still prefer to do inswing delivery but there was considerable amount of outswing delivery also. The above chart shows that inswing and near post combination scores the most corner goals (42). It fits the argument of Hughes. 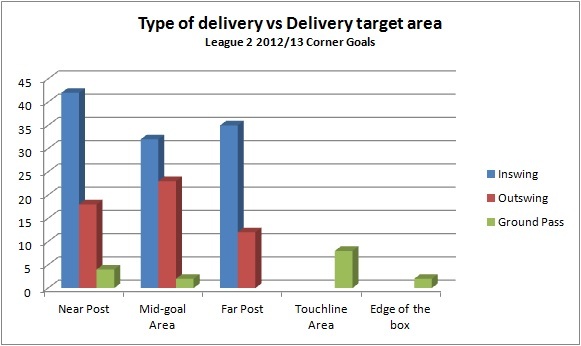 Another finding is that it is less likely to score corner goal at far post by outswing delivery (12 goals). The difference between inswing and outswing was less if the delivery target area is mid-goal area. The difference was 11 goals compared to the difference of near post (24 goals) and far post (23 goals). In short, for inswing delivery, it would be the best to deliver the ball to near post and far post, especially near post. For outswing delivery, it would be the best to deliver the ball to mid-goal area. 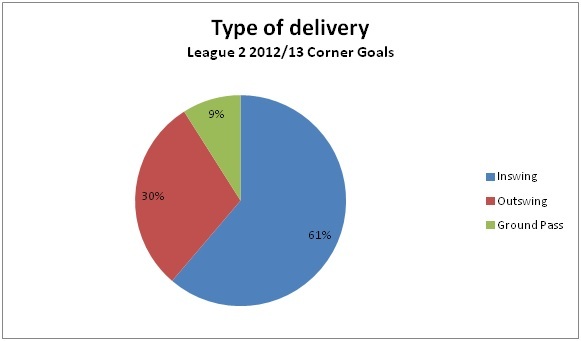 The result fits the argument of Hughes because 63% of corner goals were scored directly by the corner cross. 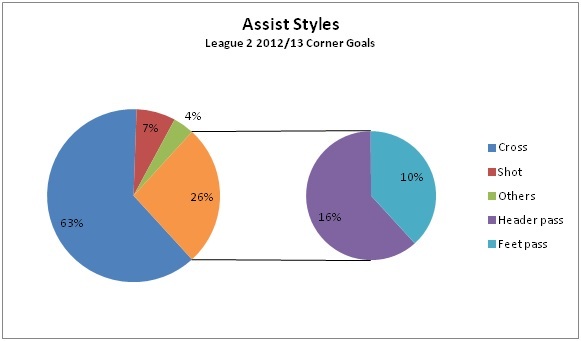 26% of corner goals were assisted by passing. Some teams may prefer to do flick-on headers to make assist but the data shows that it may not be a good choice because only 16% of corner goals were assisted by flick-on headers. If we consider passing assist only, flick-on header is a better choice than feet pass as shown in the chart with 6% more assists. Reviewing the 3 factors mentioned by Hughes, I would say 2 of them were dominating factors in League 2: inswing delivery and keep it simple. They were proved by evidences. 61% of corner goals were delivered by inswing. 63% of corner goals were assisted by direct corner cross. However, the data shows that although near post is the best choice of delivery target area, it is not a dominating factor with 36% of corner goals delivered to near post. The same type of analysis could be applied to the data of different leagues and the results could be different. Posted on 23/07/2013, in 2012/13 review, League 2 and tagged 2012/13 review, corner, League 2, set play. Bookmark the permalink. 5 Comments. That’s a good idea. I haven’t thought of that. Thank you for your suggestion. The claim that inswing corner is more effective in scoring is COMPLETELY BAISED. The reason is self-explanatory from your 3 charts, which indicates LHS corner were slightly more than RHS ones. Also, it seemed there were not much lefties in your L2, which in turn led to a majority of LHS corner being taken by righties, which made inswing corners dominated outswing ones on LHS, therefore falsely concluded inswing corner goals are more (effective) than outswing ones.